During the latter part of 2018, those who were volunteering time to the Red Springs Trail Project were earning RMMC Race Gas credits for their RMMC account. Recently I received an email from Mac L. of RMMC. Unfortunately we will no longer earn Race Gas credits for work on the Red Springs Project. Review Mac’s message below. Here at Rocky Mountain we appreciate everything that organizations like TRS do for the sport and for trail maintenance. You guys have been great!! Please respond with an acknowledgement to the terms of the program. 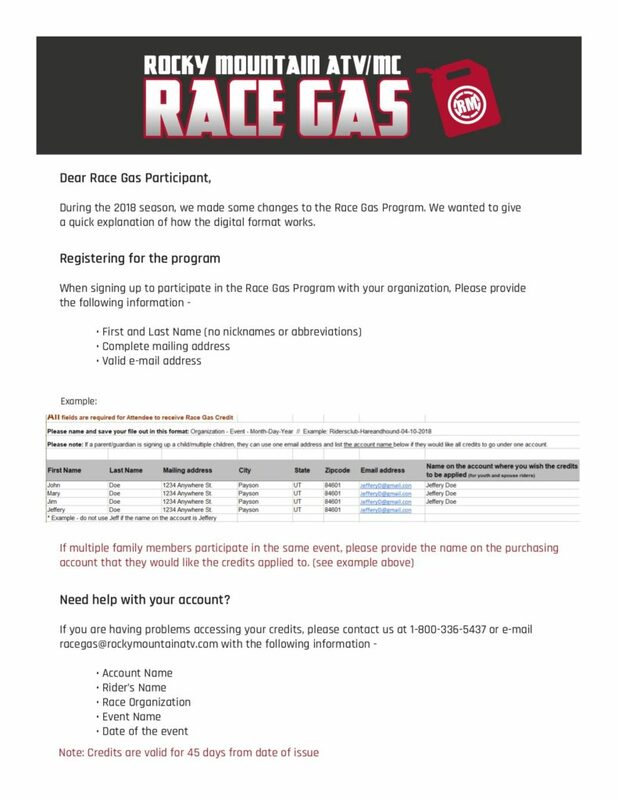 Should you have an event with 50 or more participants, we would be happy to provide RaceGas credits. I have also attached a PDF letter that you can provide to your riders. This will help them understand the program better, access their credits easier and provide you more complete data. I’m looking forward to great season with your group. If you have any questions, please let us know.